What took longest was probably coloring the fondant to match the exact Mario colors. The fondant I had was white, so it took a lot of color gel to get the right color. You can buy colored fondant, but it’s mostly available in just primary colors and black. I’m a bit of a perfectionist, so had to make sure this was accurate. I think the colors turned out pretty well! Here’s a shot of the other pieces in progress. 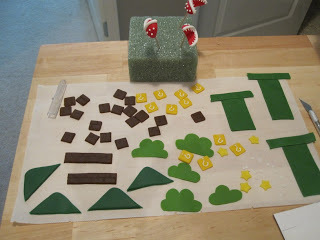 I bought a brick impression mat that I pressed into the brown colored fondant for the cake board and the brick blocks. 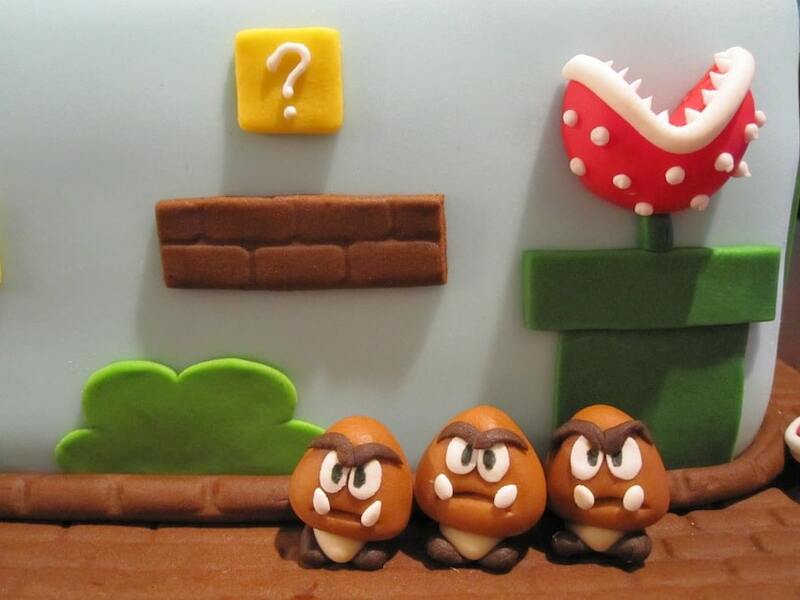 The teeth and dots on the piranha plants are made with royal icing. I was originally going to do these with gumpaste, which would take forEVER, but had some royal icing available, so tried that. I think it turned out way better than it would have with gumpaste. I didn’t initially plan to make Mario – I was way too intimidated by it. He’s such an iconic figure and I didn’t think I’d be able to do him justice. A Super Mario cake without Mario wouldn’t seem quite right though, so I went for it. May as well try, right? Worst case I wouldn’t use him. A friend of mine at work happened to have a plastic Mario figure that I used as a guide for proportions and colors. 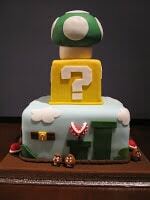 I’ll admit that Mario was a bit of an afterthought, and I made him rather quickly after the whole cake was put together. Overall, I think he turned out pretty good for a first try. I’m impressed with how he turned out, but I definitely see areas of improvement. I should have made the little buttons on his overalls and the M on his hat (I didnt even realize I missed that until a few days ago where I saw it on every Mario everywhere). I think it took me about 20 or 30mins to make him once I had all the colors done. 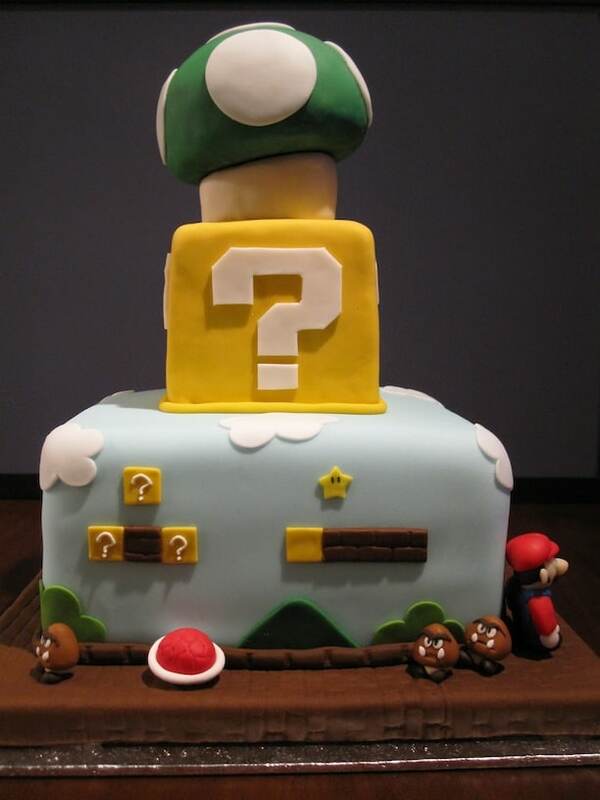 When I originally planned to make this cake I had the grand idea of remaking the entire first Super Mario Bros. level (Level 1-1) along the sides of the cake (Super Mario Bros. Levels). This proved to be a scaling nightmare to try to get it all to fit perfectly, so I quickly abandoned that idea. I then thought it would be cool to have each side be a different level (Level 1-1, Level 1-2, etc.). It would have been a ton of work making the individual colors and pieces for each side. So finally, I decided just to use a bunch of different Mario elements and do a different design on each side of the cake. Overall, I think this cake took about 20 hours to make, start to finish. Definitely my biggest accomplishment to date! Olivia, this is ah-may-zing!!! After you mentioned it to me yesterday, I had to come and take a look. Your cake decorating skills are too legit. I wouldn’t even want to cut into it – it’s too beautiful. I’d just bore underneath it like a mole and scoop out the innards, leaving the outer shell pristine and untouched. LOL! It’s funny you say that because we cut into this thing almost immediately! I was SO DONE after spending so much time on it that I was like… I need a piece of cake, where’s the knife? It stayed in tact only long enough to take pics. We did cut into the least pretty side first haha. This cake (http://livforcake.com/2010/04/my-final-cake-class.html), on the other hand, sat untouched on our dining room table until it began to sag. It was the first fondant cake I was really proud of! So it was our centerpiece for about a week. Haha. 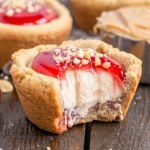 How did you make the top layer? was it cake? 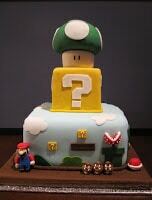 I want to make one much like this for my son but afraid the of the mushroom. BTW Your cake is GREAT!! Beautiful cake! 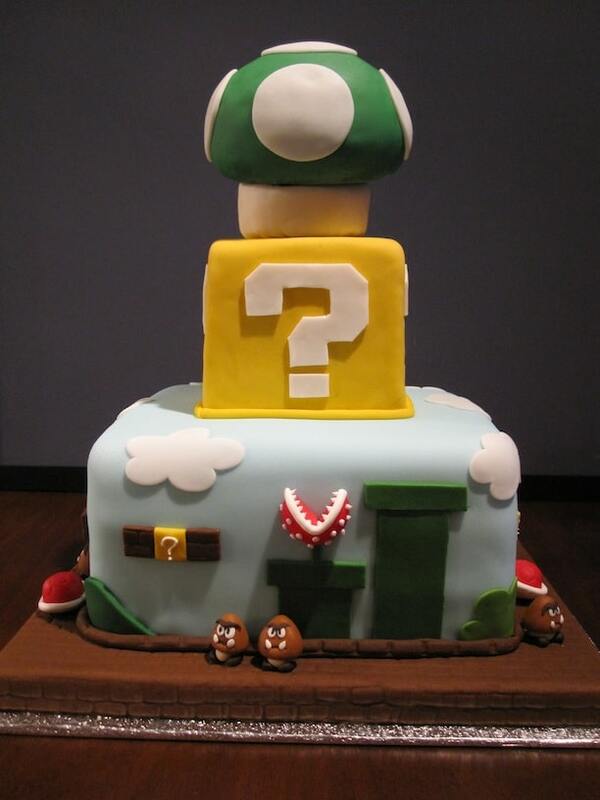 I’m making a Mario cake for my nephew… Can you share how you made the 1-up at the top? I’d like to make one too! 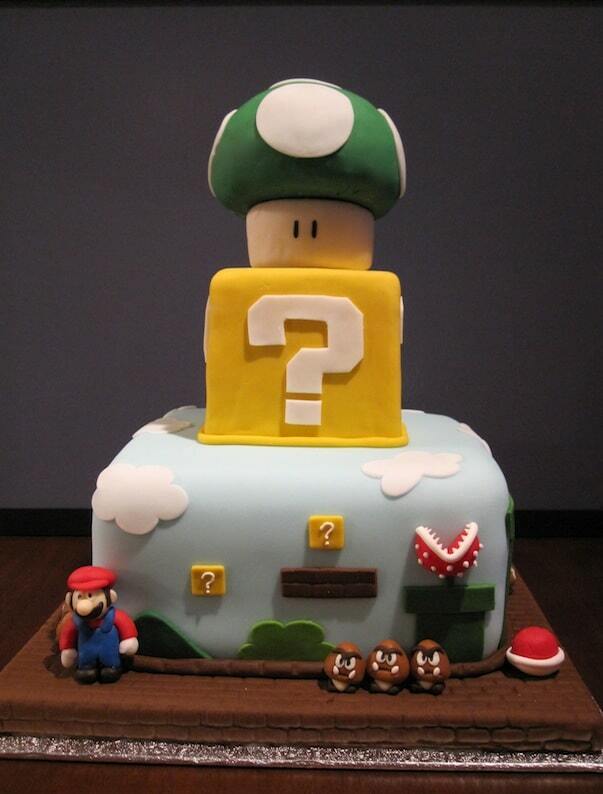 Great job, it´s a really lovely cake…congratulations!! Thank you! 🙂 and good luck! I’d love to see it once it’s finished. Thanks for the advise. I will use it. Again, I’ve looked at a dozens of Mario cakes on line and yours is my favorite. We are using your pics as templates. I think the can idea will work fine just as long as you have a cake board under the cans to place on the bottom tier and a cake board under the 8″ layer. Covering cakes in fondant isn’t too hard as long as you roll it out to the proper thickness and make sure to measure the amount you roll out to ensure it will cover the area of the cake. 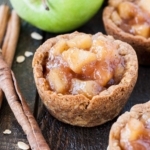 You’ve covered a few cakes already, it won’t be a stretch :). As long as the cake is sturdy (dense, not an angel food cake) you should be fine. Be sure to let the cake settle for a few hours or overnight after you stack and ice it. If you dont, when you cover it in fondant it could bulge. 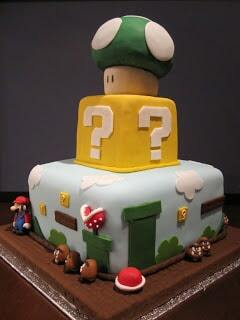 The most time consuming things for me on this cake were the figures & the question block and mushroom. hoping for a 10 in bottom layer,place two empty 8 oz soup cans covered in green fondant to make pipe and place an eight inch layer on those. I was covering another smaller can to place on top for 5 inch Mario figurine to come out of. 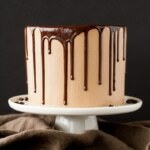 Tell me if this seems too hard for a someone who has only covered a couple of cakes with fondant. My daughter is great with making figures so all I’m concerned about is the cake falling or not being able to handle a large piece of fondant for 10 inch. I bought some Satin Ice blue ready made to use but I have made MMF in the past. What are your layers going to be? ie. how large? You could make the pipe out of RKT and cover it in fondant, then you dont have to worry about the weight of the can. I used plastic dowels in my cake, just the cheap ones you can buy from Michaels. Thanks for your advise. 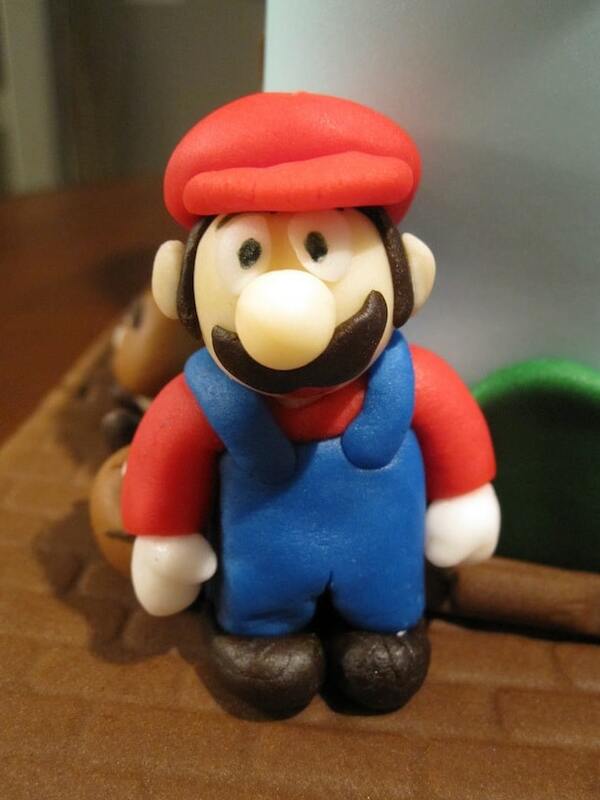 Im new at fondant and my 6yr granddaughter wants Mario. 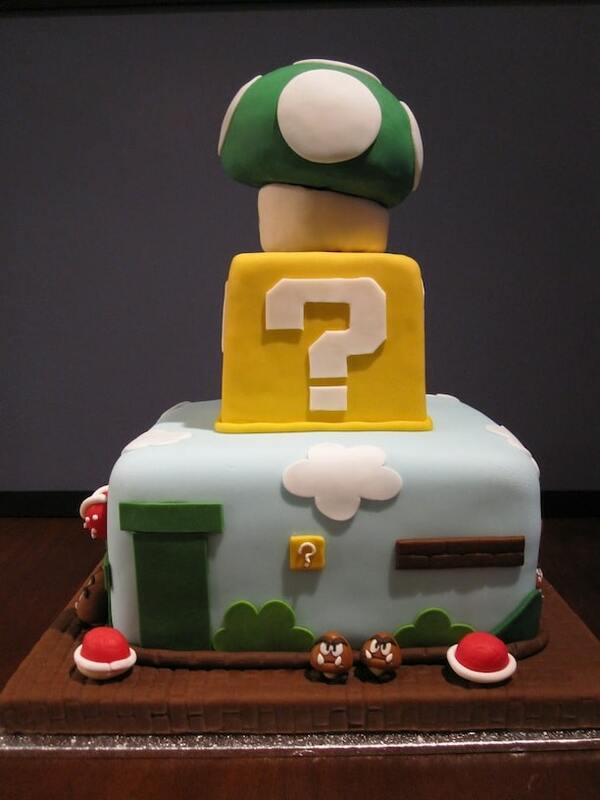 ( of all things lol) Your cake is awesome. I was going to try to separate layers with fondant pipes by covering a can but I worry about the weight. I need a big cake so I dont want to use rice Krispies. Any advise on dowels? Will the cake hold them in place with weight on them?? 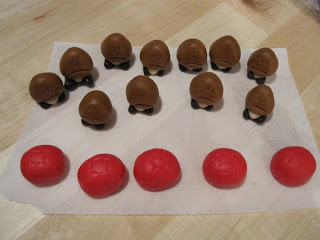 Hi Dianne, you can try using shortening instead of powdered sugar to roll out your fondant. I think that’s what I did for this cake since it’s what I learned in my classes. I sort of alternate between using sugar and shortening depending on what I’m using the fondant for. 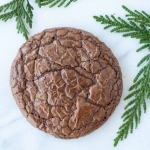 That being said, if you do have powdered sugar on your fondant I think you can dip a small brush into some alcohol and brush it over the powdered sugar. That should get most of it off. Please help. How do I keep from getting white confectioners sugar on my dark fondant when I have to roll it ?? Plus, it tasted deeeeelicious! Best birthday cake EVER!